Fade your acne marks and treat deep scarring with a savvy skin-care regimen. If you suffer with unsightly red marks or pitted pockmarks due to your acne, you are not alone. Acne affects nearly 85 percent of people and by their mid-teens, 40 percent of adolescents have acne scarring, according to the American Academy of Dermatology. Red marks and pockmarks require different treatments to heal the skin. Red marks, or the effects of postinflammatory hyperpigmentation (PIH), typically fade within 6 to 12 months using a step-by-step treatment regimen. A laser-based or prescription-strength treatment however, fades pitted pockmarks, or permanent scarring, within one to three applications. Wash your face with a mild cleanser without granules. Cleansers featuring granules may create tiny tears in the skin that heightens melanin production. Leave the cleanser on the skin for at least a minute to cleanse skin thoroughly. Rinse off with lukewarm water. Apply a scar-fading serum, cream or gel packed with Vitamin C, kojic acid or arbutin every morning to even out your skin and help lighten the red marks. To prevent skin irritation, select a product formulated for your skin type. Minimize the effects of (PIH) with products featuring hydroquinone and retinol. PIH occurs when the skin creates additional melanin. Hydroquinone is a bleaching agent that blocks melanin production around the red or brown areas, while retinol exfoliates the skin, smoothes lines and helps to fade discoloration. Apply a pea-size amount to the pockmarks or red marks nightly, with your fingertips, to avoid irritating your skin. Squeeze the juice of one whole lemon in a small plastic bowl. Dilute the lemon juice with 1 cup of water. Dampen the edge of a cloth or small towel with the diluted lemon juice. 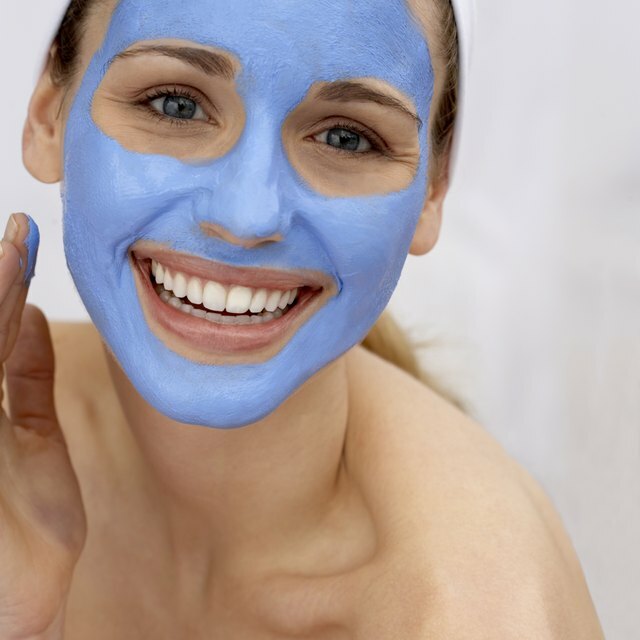 To help fade the discoloration, rub the cloth gently into the acne scars for three to four minutes. Repeat this process once a day to encourage new skin growth and exfoliate skin. Exfoliate skin with an at-home chemical peel featuring salicylic acid or alpha hydroxy acid or a do-it-yourself microdermabrasion kit. These treatments encourage the production of new skin cells and help to fade the appearance of the dark and pitted marks on your skin. Follow the kit’s directions carefully and adhere to product time limits, to prevent burning or damaging skin. Smooth on an acne treatment featuring retinol or tretinoin (Retin-A). Retinol and Retin-A not only build up collagen to pump up your pitted marks, but these products also reduce acne breakouts. Apply an SPF-based moisturizer to rehydrate and protect skin. If you suffer with acne breakouts, an oil-free, “non-comedogenic” moisturizer won’t clog pores or aggravate your acne. Visit your dermatologist for a laser treatment, a hyaluronic acid or collagen filler or a prescription-strength fade cream to treat pitted depressions. Ask your dermatologist to prescribe a treatment that may lighten the red or pockmarks faster. Laser resurfacing treatments burn off the top layer of the skin, boost the production of new collagen fibers and reveal tight and smooth skin. After one to two laser treatments, most pitted acne scars fade. A dermal filler smoothes and plumps skin and requires multiple applications to plump up and fill pitted scars. Smooth on a sunscreen daily. The sun’s rays may aggravate your inflamed skin and increase discoloration. After rubbing the lemon juice on your skin, rinse with lukewarm water. Following this skin-smoothing treatment, re-hydrate your scrubbed skin with a moisturizer. The moisturizer helps the skin recover from the lemon’s exfoliating and skin-lightening properties. If you have sensitive skin, use soy-based products instead of hydroquinone and retinol to fade scars. MSN Living: Your Top 10 Skin Annoyances—Solved!